This is the links section of the site. Just below you can check out preservations of old sites & individual webpages pages hosted on this site's servers. Some of these were simply saved from the internet at the time by myself and Canadian fan Patrick Soucy and the originals are now offline, some are still online but have changed significantly since saving, and others were donated to the site and are presented here courtesy of their former webmasters to be preserved here for the future. Please note that not all of the pages, images & links will be working (Most of the video download links aren't), but they are as complete as they can be. 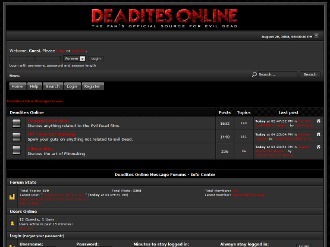 If you're a former Evil Dead fansite webmaster and want your ex-site hosted & preserved here for current and future fans to enjoy, then email . Further down this page you can see links to other Evil Dead and horror related websites currently online around on the internet. 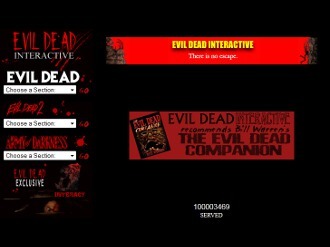 Here is a list of links to other Evil Dead and horror related websites currently online around on the internet. To exchange website links please email us using the link at the bottom of the page. You're welcome to use the link banner below.